Ohio State defensive linemen Chase Young (2) and Nick Bosa (97) meet at the quarterback on a sack of Oregon State’s Conor Blount last Saturday in Ohio Stadium. COLUMBUS – There will be enough sacks to go around for everyone on Ohio State’s defensive line this season, but no one will reach the prodigious number Chase Young suggested he would like to see Nick Bosa produce. “I hope Nick gets 200 sacks. That’s my brother. That’s how much I love him,” Young said after Ohio State’s 77-31 win over Oregon State last Saturday. Bosa had two sacks in the Oregon State game. Dre’Mont Jones also had two and Young had two quarterback hurries. Because of the lack of competition the Buckeyes faced in last week’s opener it might be much too early to talk about this year’s defensive line in the same breath as last year’s, which was in the conversation about best defensive fronts in college football. But with Bosa at one end, Young and Jonathon Cooper playing at the other end and Jones and Robert Landers at defensive tackle, OSU can still make life very uncomfortable for quarterbacks. The context of Young’s double hundred wish for Bosa was that a reporter had just asked if the defensive linemen were competitive about who gets credit for the most sacks. “It doesn’t matter if I get a sack. It doesn’t matter if Dre’Mont gets a sack. Cool. Whoever. If we meet at the quarterback, you know if Nick didn’t get a sack, I’d get a sack,” Young said. 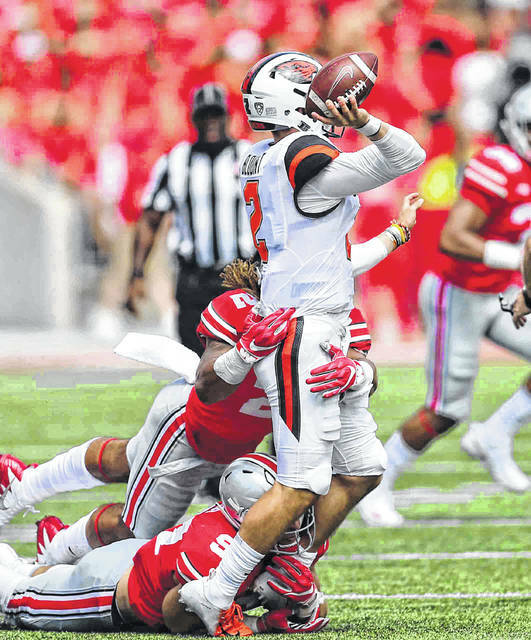 Chances are good OSU’s defensive linemen will be meeting at the quarterback again against Rutgers on Saturday at Ohio Stadium (3:30 p.m., Big Ten Network). Rutgers started a true freshman quarterback Artur Sitkowski in a 35-7 win over Texas State last Saturday, and while he threw for 205 yards and a touchdown, he also had three interceptions and probably was fortunate not to have one or two more passes picked off. A quarterback’s age is irrelevant, Jones said. Ohio State’s defensive line treats them all the same way. “Our eyes light up regardless of freshman, sophomore, junior or senior. He’s a quarterback, we want the quarterback. We’re going to get after him,” Jones said. Ohio State had 45 sacks as a team last season, the eighth time in the last 20 years it has had 40 or more in a statistic that first showed up in OSU’s season stats in 1981. Vernon Gholston’s 14 sacks in 2007 is the OSU season record. Joey Bosa is next with 13.5 in 2014 and Mike Vrabel had 13 in 1995. The only time two Buckeyes had 10 or more sacks was in 1994 when Vrabel had 12 and Matt Finkes recorded 11. Sitkowski was 20 of 30 passing but rushed the ball only twice, which means he might have to survive game-long pressure from OSU’s defensive line. “Coach Schiano (defensive coordinator Greg Schiano) really puts it in the hands of Coach J (defensive line coach Larry Johnson) what he lets us do. And Coach J, he lets us go. If the quarterback is not a running quarterback, he’s going to let us go,” Young said. Young predicted freshman Tyreke Smith will earn playing time quickly on the defensive line. He was the first freshman to get into last Saturday’s game. This entry was tagged Big Ten, Chase Young, Nick Bosa, Ohio State Buckeyes. Bookmark the permalink.